All transactions are safe and secure with a reliable history in online purchasing behind each of our associates. Buy the I Love Lucy Trendsetters t-shirt to own I Love Lucy clothing and merchandise. Who would wear a burlap sack as a dress? Lucy Ricardo and her faithful sidekick Ethel Mertz would...only because their sly husbands, Ricky Ricardo and Fred Mertz, convinced them that the dresses were designer originals. As their wives strutted in sacks, the men thought they had the upper hand. Lucky for the women, they were mistaken. 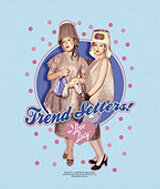 Lucy and Ethel got the last laugh when they got labeled as "Trendsetters". Grab one of these I Love Lucy t-shirts and get the last laugh. In addition to the I Love Lucy Trendsetters tee above, browse the I Love Lucy Clothing Gallery for more apparel like men's and women's clothes, kids shirts or hoodies.